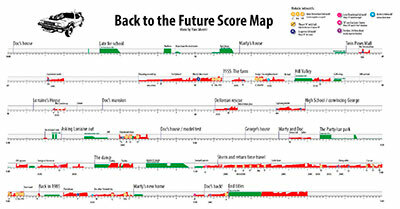 A "Score Map" is a graphical representations of the entire score for a film. They allow visualizing the placement of the music and main leitmotifs all along the movie. The curve represents the energy level of the music in a scale from 1-5 at every minute. Red curves represent orchestral underscores, and green ones, source songs. Download in JPG format the Score Map. This is a low resolution version. For the Full/scalable resolution see below. Thanks for supporting the Score Maps Project. All funds will be destined to the development of new Score Maps. Once you confirm payment, you will receive a download link and an Access Code for future updates and discounts. Three (3) Full resolution Score Maps in PDF and JPG format. Coming soon, the Star Wars Original Trilogy Score Maps.